Our preferred product issuer’s platform provides you with one of the best range of charts in the trading industry. 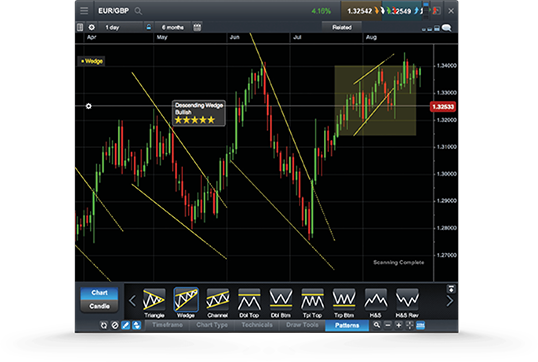 It also includes a host of features to support your analysis, including multiple chart types, over 80 technical indicators and drawing tools, pattern recognition and a chart forum community. The charting package of the ‘Next Generation’ platform includes ten different chart types, including the popular line, OHLC and candlestick charts, plus more advanced charts such as kagi, line break and renko charts. All charts come with 24 drawing tools that can be used to draw support and resistance levels, make notes on charts and highlight key price moves and patterns. 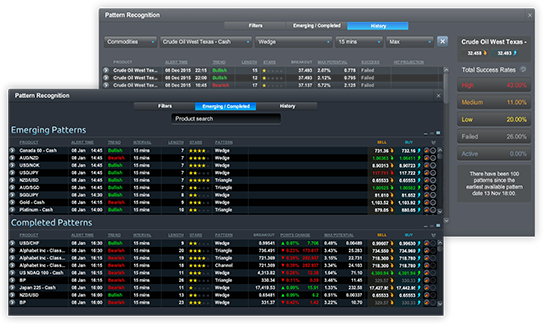 Identify trend reversals, significant price levels and trading opportunities. Choose from 75 technical indicators including Bollinger Bands®, SMAs, ichimoku clouds, MACD, RSI and many more. Charts for our major products cover as much as 20 years' worth of price history, allowing you to analyse price performance over the long-term and short-term. The ‘Next Generation platform provides you with layouts, charts and technical indicators that are all customisable, offering you the ability to set up your charts and technical analysis exactly as you like. Open trades directly from charts as opportunities emerge – just click on a live streaming price to open an order ticket and place a trade. Let the pattern recognition tool scan for common technical patterns, such as head and shoulders, triangles and wedges, on any open chart across various time intervals, and view the price projection target area on the chart.